The appreciation luncheon on April 26, 2006 turned out to be a surprise for me. Director of Office of International Students and Scholars (OISS) at Rice University, Dr. Adria Baker, said that they nominated me for the GSA Student Awards but since I couldn't win, they wanted to acknowledge what I did (well I didn't do anything :)) by giving a plaque with my name on it. Another honor was the award presenter, Dr. Jordan Konisky, Vice Provost, Research & Graduate Studies and Professor, Biochemistry & Cell Biology (he is in the middle in the picture). He, with his usual smile, greeted me with a big congratulations, overwhelming me a little more. Who can forget Dr. Vinod Kumar's presence (the one on the very right of the picture ). He was my partner in the organization we founded, Rice International Student Association. 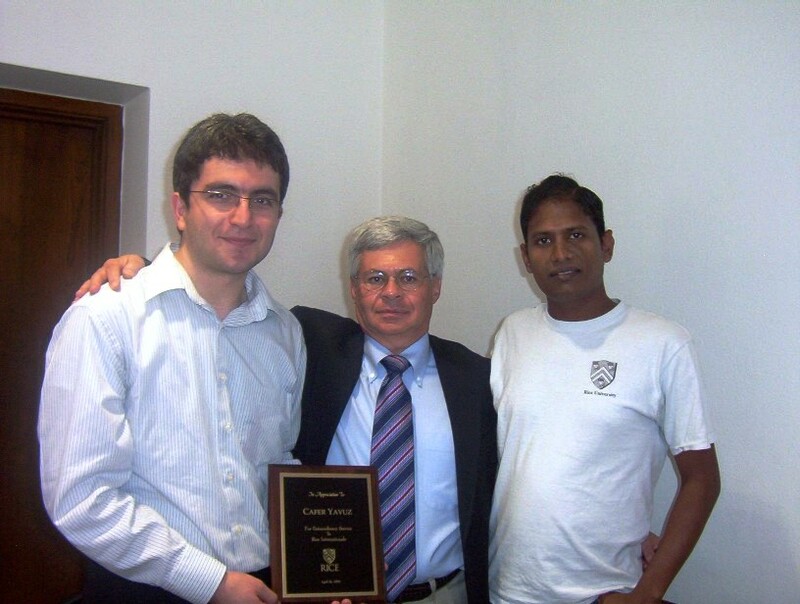 Thanks for everything, Adria, Vinod, Dr. Konisky and everyone at OISS.